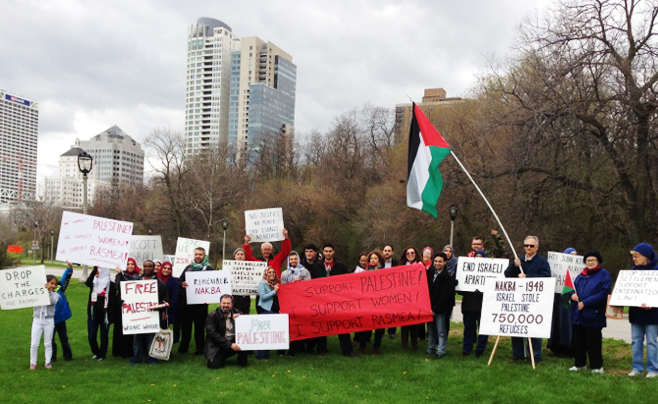 Milwaukee vigil remembers Al Nakba, calls for solidarity with Rasmea Odeh | Fight Back! Milwaukee, WI - Dozens of Palestine solidarity activists gathered on the lakefront here, May 15, during rush hour to commemorate Nakba Day. Al-Nakba or "The Catastrophe" refers to May 15, 1948, the day after Israeli "Independence Day.” In 1948, 700,000 Palestinians were expelled by Zionist troops under the pretext of establishing a Jewish state of Israel on Palestinian land. 400 Palestinian villages were depopulated and taken over or destroyed by the Israelis, laying the foundation for the continuing occupation of Palestine. In response to continuing occupation and oppression of Palestinian people by the U.S. and Israel, activists held signs demanding "End U.S. aid to Israel," and "Drop the charges against Rasmea Odeh!" Members of the Milwaukee Palestine Solidarity Coalition responded to the national call to action to support Rasmea Odeh, a veteran Palestinian activist. Odeh is a 66-year-old community organizer who has dedicated her life to the empowerment of Palestinians, especially Palestinian women. She is the victim of a U.S. government attack which is intended to jail or deport her for allegedly lying on a 20-year old immigration form. Her trial is set to begin on June 10 in Detroit. As the boycott, divestment and sanctions (BDS) movement against Israel grows more successful by the day, activists are facing repression from the U.S. government. Activists in Milwaukee say they will continue to win victories for the BDS movement while defending Palestinian community leaders like Rasmea Odeh from political attacks.